Lots of broken carnies and no money and I are one of them. Egbertus Jan "Dutch" Berghege, photo postcard, Detroit, ca. 1921. Ronald G. Becker Collection of Charles Eisenmann Photographs, Syracuse University Libraries, Special Collections. Before transforming himself into a human picture gallery, Egbertus Jan Berghege (1882-1942) toiled as a farmer in the small village of Renkum, Netherlands. At the age of twenty-nine, in pursuit of a better life, he trekked to the bustling seaport of Rotterdam and boarded a steamship destined for London. It was the first leg of a grueling journey to North America. By crowded trains, boats, and no-doubt foot Berghege pressed on to Bristol, Halifax, and eventually Toronto. But the real journey was still ahead. Ultimately, he had eyes for Michigan, and for good reason. The western part of the state was home to the largest community of Dutch immigrants in the U.S. It boasted lush farmland, good factory jobs, and friendly faces; his cousins had settled there a decade earlier. And so, in the winter of 1914, with twelve dollars in his pocket, Berghege crossed the Canadian border and made his way to Grand Rapids. Fellow Dutchman and exuberant carnival owner Henry J. Pollie may have influenced Berghege during this period. His popular Zeidman and Pollie Shows (co-owned with William Zeidman) was headquartered in Grand Rapids and opened there every spring to large audiences. The show employed upwards of 400 people, including dozens of colorful attractions like pioneering tattooers William Grimshaw and Eddie “Hap” Hazzard. Whether Berghege interacted with Pollie at this time is unclear, but he certainly knew about him. And the two would correspond in later years. Prof. William Grimshaw from a Pollie & Zeidman advertisement, The Billboard, July 29, 1916. Prof. Eddie Hazzard from a Pollie & Zeidman advertisement, The Billboard, June 9, 1917. By 1918, Berghege had relocated to Detroit, where he cobbled together work as a handyman, fireman, and truck driver. Along the way he encountered another bright light in the amusement world, Percy Waters (1888-1952). 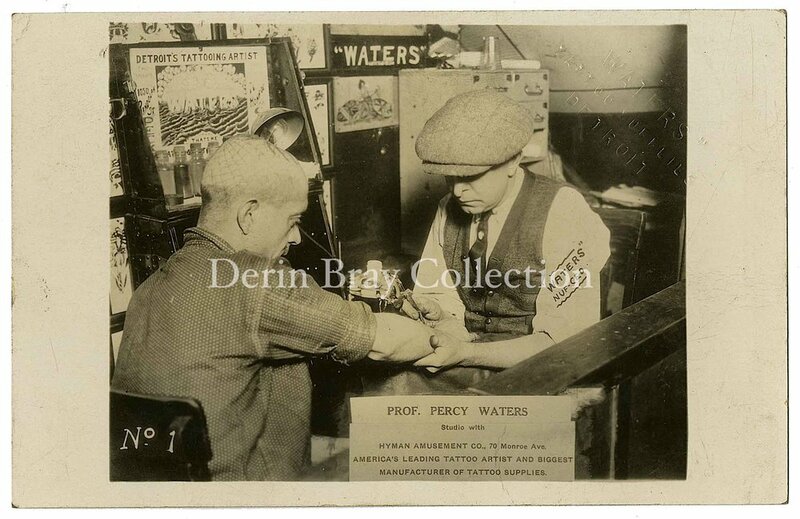 Waters had moved to the city just a year earlier and was busy establishing the country’s preeminent tattoo supply business. On his path to success, he covered a slew of Detroit characters to spectacular effect. Among his human canvases were local autoworker Shelby Kemp and machinist Thomas Edward “Van” Vanderwerger, best-known for the spider web tattooed on his head. Incidentally, Waters probably also instructed Van in the mysterious art and craft of tattooing. He worked in one of Waters' arcade shops in the early 1920s and the two occasionally appeared together in promotional material. Berghege took the plunge around 1920 and submitted to the painful process of being tattooed for exhibition. Waters covered him from neck-to-ankle with eye-catching designs ranging from Buffalo Bill Cody to Saint George and The Dragon. His back was decorated with the iconic Pharaoh’s Horses and his belly with a harrowing scene of an angel rescuing a drowning man. As a small tribute to Berghege’s Dutch roots, Waters also put The Crown of Netherlands just beneath his neck. Old photographs of Waters' masterpiece occasionally bear the nickname “Dutch." Although Berghege would respond to this moniker for the rest of his life, he chose to perform, instead, under the anglicized name Bert Berger. This may have been to avoid confusion with veteran Chicago tattooer, Albert "Dutch" Herman, also known as "New York Dutch." 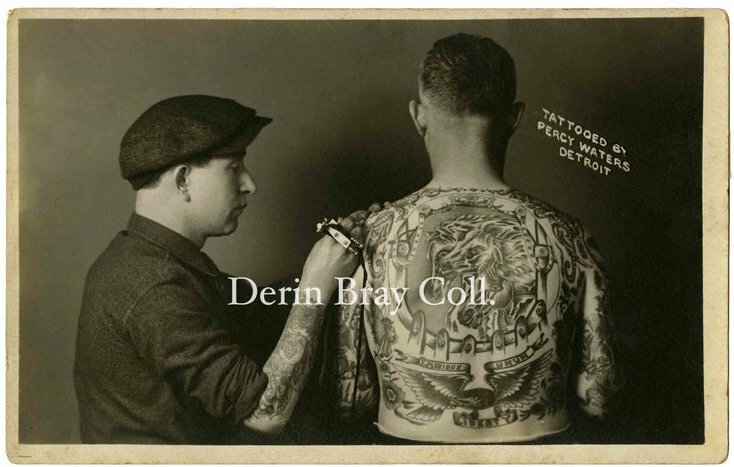 For the next decade Professor Bert Berger grinded out a living as a tattooed attraction and tattoo artist with ten-in-one shows, including a stint at Granada Park in Detroit and later with Heller’s Acme Shows. In 1932, amidst the Great Depression, he signed on with familiar concessionaire Henry Pollie and his son John. Berghege filled a number of roles for the Pollie Shows beyond that of a tattooed person. In fact, as the season progressed, he gained more attention for his prowess as a carnival grunt –always ready to light a show or poster a town— than for his act. The writing was on the wall. A couple of months later, with a new season on the horizon, Pollie invited Berghege to rejoin the show. His letter fails to mention anything about tattooing, but alludes to his abilities as an electrician and suggests that he could work the kitchen: “We all liked your cooking, so maybe you’d like to try some chops, etc...” Indeed, Berghege's act seems to have fizzled by this time. The tattooed man for the show that year was, once again, Eddie Hazzard. This was Berghege's course from here on out. He continued to troupe with shows up and down the east coast, but slogged away as a carpenter, electrician, and chef. Never as a tattooed attraction. He built panels and lighting strings, wired show fronts and rides, and cooked for cast and crew. It was a hardscrabble existence. He echoed this sentiment in a 1939 postcard to John Pollie. Berhgege had landed in sunny Vero Beach, Florida, home to the Johnny J. Jones Exposition, but lamented that there were, "lots of broken carnie’s and no money and I are one of them." Barglege [sic] – Egburtes [sic] Jan (Dutch), veteran tattoo artist formerly with carnivals, in Carr Hotel, Pittsburgh, December 20 [sic]. He was employed as an electrician in recent years. Acknowledgements: A special thank you to Marian Matin, Archivist and Assistant Professor at the Clarke Historical Library, Central Michigan University, for her help with this article. In 2006, Marian undertook the monumental task of cataloging the John C. Pollie Papers, a remarkably intact and breathtaking account of carnival life and business from the 1910s through the 1960s. The Pollie Papers are a wonderful resource for anyone studying popular entertainment, sideshow, and carnival history in America. 2. For more information on Percy Waters, be sure to check out the below publications (listed in no particular order). 3. For great insight into the lives and careers of William Grimshaw and Eddie Hazzard, see Jon Reiter's, These Old Blue Arms: The Life and Work of Amund Dietzel, Vols. 1 & 2.